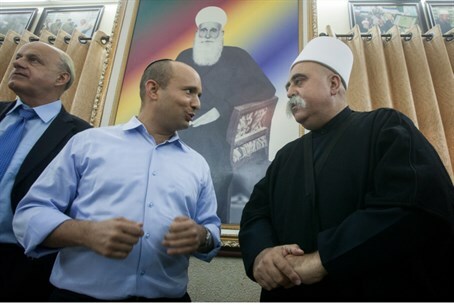 Bennett volunteers to represent Druze Israelis. ‘I love the Druze community,’ he declares. Minister of Economy Naftali Bennett, head of the Jewish Home party, has volunteered to be “the Druze minister” in government. Bennett wrote his post following a day visiting Druze villages in the Galilee. “We’re working in the Golan as well, to connect Druze there to the state of Israel,” he wrote. Many Druze in the Golan are torn between loyalty to Syria and to Israel; some continue to support the Syrian regime, but a growing number have turned against Syria's leaders as the Syrian civil war continues. Bennett hinted that government policy was to blame for the confusion. “Governments have been stammering on the issue for too long, so I’ll make it clear: the Golan Heights will be Israeli forever. Period,” he wrote. “That’s why the time has come for you, Druze living in the Golan, to decide that you, like your brothers in the Galilee, are with us,” he declared. “The government of Israel has just decided to invest 209 million shekels in Druze in the Golan. We want you. I love you!” Bennett concluded.